Which actress has the best chemistry with SRK? I wanted so badly to find the chemistry between Kajol and SRK that so many other fans can plainly see but I could not. She is a very good actress, seems to have a sparkling and likable personality but I didn't see anything out of the ordinary in the films they made together, and I watched them more than ones to be absolutely sure. Whatever magic they're conveying to others is totally lost on me Loved her in My Name Is Khan! I do feel that he and Juhi Chawla have a special bond/chemistry. I think it comes from being great friends, co-stars and business partners. I see a level of comfort and familiarity when they're on screen together that I don't see with anyone else. and they made sooo many wonderful films together. I personally love SRK and Rani. Loved all of their movies together with KANK being my favorite. It was before its time, on a taboo topic and well acted IMO. My second favorite is Juli, with Yes Boss being my favorite. I like Kajol with SRK in some of their movies together, hence she is my third choice. I actually like Kajol with Aamir better. True apart from probably Katrina Kaif SRK has good chemistry with most of his heroine's. He is special in that regard. Everyone feels different about chemistry, no need to force yourself to "get" it lol. While SRK and Juhi are kind of sweet together, I never saw much magic there. They are too innocent and almost childish as a couple in their movies. Also often ishe was wasted like in Darr, Ram Jaane etc. and some were just medicore (One 2 ka 4, Duplicate, PDHH). They were solid in Yes Boss and RBG. watching KKKG, Kajol is good in this also. They are good together. This was my first SRK film back in June. I think he's so charismatic that he totally outshines all his female co-stars, no one stands a chance next to him. Chemistry with Juhi was exactly what you described, not of a romantic nature, just very good friends. Yeah today is K3G's 15th anniversary, crazy how fast time passes. Watched this movie the first time back in 2004 on tv (first Bollywood movie that was aired in Germany). 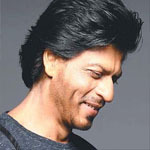 True about SRK's charisma, even makes some of his lackluster movies watchable because he is always great. So you are a pretty new fan, how many SRK movies have you already watched? I have see all of his films more than once Back in June I subscribed to Netflix. Went straight to foreign movies and found Kabhi Kushi Kabhi Gham, my first . Then I saw Kuch Kuch Hota Hai and Kal Ho Na Ho. Three of the most beautiful, emotionally charged films I've ever seen. My Baptism by fire is how I recall those first few days. Those were the only SRK films on Netflix so I looked for SRK filmography on the Internet, got a list of titles in chronological order, went to my local library and started borrowing. What my library didn't have they borrowed from other libraries. Yeah you really began with some emotional movies, I think these three are really good "beginner" movies though. They really show what makes Bollywood special. Great to see you already watched all of them, do you have any favourites? Kajol. They are just too adorable off screen. I want to see Vidya with SRK just for the promotional interviews together. She is awesome. He said "I could be with a cow on screen and make it look like chemistry"
That's what Kajol mentioned in the very first Koffew with Karan episode! I'm pretty sure she also said with a tree trunk... but it's true, anyway! Anushka and SRK were again awful together in Zero, hope that pairing is done for good now. It turned out to be even worse than SRK/Katrina. Clearly it only worked in RNBJ because it was supposed to be awkward. Only popular actress right now that SRK works ok with is Deepika..
Srk should stop now to making chemistry with actress. This is not the age or time to make chemistry with actress. If he do so he has to make romantic movies again where he has equally footage to actress and people simply won't tolerate now. I don't think Anushka Kat were bad with srk but people don't want srk to woo his leading lady in the movie. He should move now. No one cares about jodi chemistry anymore, the script makes actors look good together even if they never have worked together before. Who are SRK's Top 3 best/worst co star's for you?